Restricted Availability is a long awaiting new feature for Share Timetable. This allow the Timetable owner to explicitly control when resources are available. 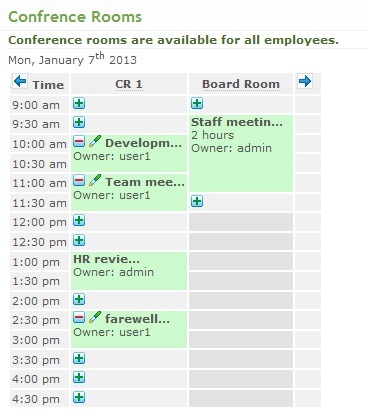 In the example below the owner did not open Board Room resource for booking at the second part of the day. This new feature allow Timetable owner complete control on the resource and it availability. With introduction of this feature appointment scheduling can be performed with Share Timetable. For example hairstyle salon appointments where each chair is a resource and clients can enter the timetable and choose their favorite stylist and appointment time. The stylist role is to make his or her chair available in his or her working hours. Company car is not available when it in service. Tennis court is not available for play when between 2-pm and 4-pm. Lab equipment is only available during the semester. Restricted Availability is available with Premium Subscription.